The Predators’ second-round loss to Winnipeg last week was met with deep disappointment, considering Nashville had advanced to the Stanley Cup Final in 2017 and claimed the Presidents’ Trophy following the 2017-18 regular season. Now begins an offseason of tweaking more than re-tooling for the Predators, who will bring back virtually their entire talented roster from this record-breaking season. Which Preds players head into the offseason feeling good about themselves? None are happy after getting knocked out in the second round, but some of the team’s individual playoff performances were still good. It’s hard to look past the first line of Filip Forsberg, Ryan Johansen and Viktor Arvidsson, who combined for 39 points (17 goals, 22 assists) in the 13 postseason contests. Forsberg led the Preds in goals (seven), finished tied for first in assists (nine) and seemed to produce a highlight reel goal every few games. Arvidsson had two more goals this postseason than last, despite playing nine fewer games. Johansen may not have produced as much offense as the Preds expected over the past couple of regular seasons, but he’s stepped up his game in both postseasons. The 25-year-old has averaged a point per game in the playoffs over the past two years (27 points in 27 games) after averaging .71 points per game (115 points in 161 games) during those two regular seasons. Which Preds players head into the offseason feeling not-so-good about themselves? It’s still hard to figure how the talented second line – which featured Kevin Fiala (23 regular-season goals), Kyle Turris (35 regular-season assists) and Craig Smith (25 regular-season goals) – combined for just 11 points in 13 playoff contests. There were times the trio did produce some chances, but plenty of other long stretches where it was ineffective. Turris, who had 10 points in 19 playoff games with Ottawa last season, shouldered some of the blame. If any line is especially open to tinkering at the start of next season, it could well be this one following the disappointing playoffs. What does the goaltender situation look like moving forward? The playoffs obviously did not go well for veteran netminder Pekka Rinne. 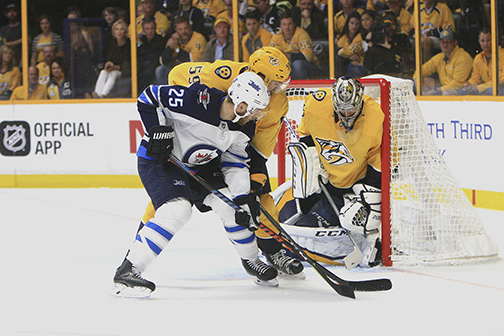 Though he’s likely to win the Vezina Trophy as the NHL’s top goalie this summer (voting was done before the playoffs), Rinne suffered through a sub-par postseason, as he was pulled four times in 13 games – three times in the seven-game series against Winnipeg. He finished the playoffs with a 7-6 record, 3.07 goals against average and .904 save percentage, all those numbers a significant drop from the regular season. But one rocky postseason won’t be enough to open the goaltending job up for competition, according to Laviolette. Juuse Saros, 23, may be the Preds’ future goalie, but it sounds as if he’ll be No. 2 again when next we see the Preds in action. “Pekka’s been the No. 1 goalie for this organization, we’ll go into next season the same way,” Laviolette says. “I mean he’s up for the Vezina Trophy, he’s one of the best goaltenders in the world, we’re fortunate to have him. Rinne, 35, has averaged 60 starts during the regular season over the past two years, while Saros has averaged 21. It wouldn’t be a surprise to see Saros’ percentage increase next season as Rinne enters the final year of his contract. What should Preds fans expect of Eeli Tolvanen next season? Expectations were out of control for the Predators’ 2017 first-round draft pick after he put together a great rookie season while playing in Russia’s KHL. The 19-year-old Tolvanen arrived in Nashville to great acclaim late in the Preds’ regular season and played three games without making much of an impact. It shouldn’t have come as a surprise, considering Tolvanen hadn’t spent a day in training camp, let alone played a single NHL contest. There’s still plenty of reasons to expect good things from Tolvanen, who has also flashed his skills at the Olympics and IIHF World Champion this season. But he still may need some seasoning and still needs to adjust to the smaller North American rinks. So, it’s not out of the question that he could spend some time in the Preds’ AHL affiliate in Milwaukee, just like current Nashville forwards Forsberg and Arvidsson. Are there names to watch in the pipeline moving forward? Barring injury or trade, the Preds won’t have much room on the roster for new blood next season. They’ll likely return 12 forwards – 13 if you include Tolvanen – along with seven defensemen and both goalies. But it’s still interesting to know what talents are standing out in the system. One of the more intriguing offseason questions is whether defenseman Dante Fabbro, the Preds’ first-round selection in 2016, will choose to turn pro or return to Boston University for his junior season. The 6-1, 192-pound blueliner improved his points production by more than 60 percent during his sophomore season, totaling nine goals and 20 assists in 38 games. Another name to watch is forward Tanner Jeannot, an undrafted player who recently signed an entry-contract with the Predators. The 6-3, 215-pound Jeannot put up big numbers – 40 goals, 40 assists in 72 regular-season games – for Moose Jaw of the Western Hockey League. He’ll be in Milwaukee next season. One of Jeannot’s teammates in Milwaukee will likely be Swedish forward Carl Persson, signed by the Predators earlier this month. The 6-0, 205-pound Persson, who is 22 years old, has shown some good skill overseas. Playing in Sweden’s top league last season for the first time, he finished with 13 goals and 11 assists in 52 games.